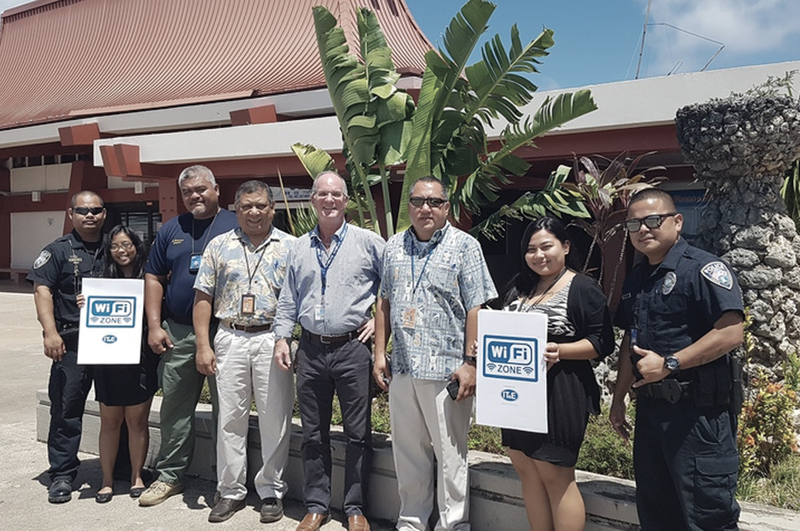 IT&E installs free airport WiFi for arriving passengers — Citadel Pacific Ltd.
IT&E has recently installed free WiFi for all arriving passengers at the Saipan International Airport. This new service is in addition to the free internet services already provided at the departure gate for domestic flights. General Manager Rose Soledad stated that the project had been a collaboration with the Commonwealth Ports Authority in partnership with the Marianas Visitors Authority. “Our arrival terminal is the first gateway in the tourist experience in the CNMI and with the support of the Commonwealth Ports Authority, we’ve installed high speed internet for arriving passengers of domestic and international flights to use when they disembark and before they reach customs,” she says. Commonwealth Ports Authority executive director Chris Tenorio expressed that many arriving passengers utilize the free WiFi with ease. “On behalf of the CPA board and management, we thank IT&E for the free wireless internet that is available for passengers to use. We’ve received great feedback and see that this service is a great addition to our facilities,” says Tenorio. Sales and Marketing Manager Hans Mickelson added that several international flights could easily avail of the free internet during their arrival and will continue to have internet access at the baggage claim area.